11 Paper Place is a love story about two sheets of paper that magically transform into paper people as they are spit out of a malfunctioning printer into a recycling bin. 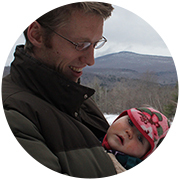 Daniel Houghton has taught animation and video production to college students at Middlebury College and to high school students before that. His animations have screened internationally in Europe, Asia, Africa; domestically in New York and Los Angeles; and online at The Atlantic, Huffington Post, Wired, PBS and over 250 blogs. He is currently managing a range of media projects for the arts division of the Digital Liberal Arts initiative at Middlebury College. Vermont PBS is proud of its long heritage as Vermont’s statewide public television connection, and as a vital source for the stories that define Vermont. Talented local filmmakers regularly turn to Vermont PBS as a partner in showcasing films that explore the people, the issues and the landscapes of northern New England. Through our on-air and online platforms, and our expanding community partnerships, we’re using the power of public media to bring communities together around content of consequence.